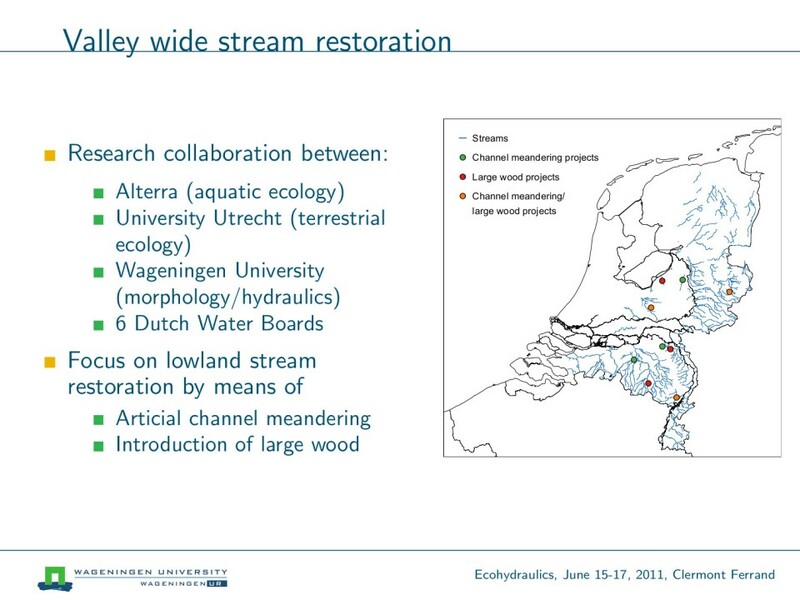 Within the Dutch research project ‘Valley wide meander restoration’ six streams will be monitored over a 2 year period. The monitoring program aims at understanding both the initial morphological and the ecological processes. The present study focuses on the morphodynamic developments that took place after the completion of two restoration projects. The morphology and hydraulics of the field sites are evaluated using sequential GPS-surveys, LiDAR based digital terrain models, discharge records, water height records and information from sediment samples. The Hagmolenbeek can be described as a conventional stream restoration project. The meandering planform was designed to coincide with the planform it had in history, before straightening of the stream. 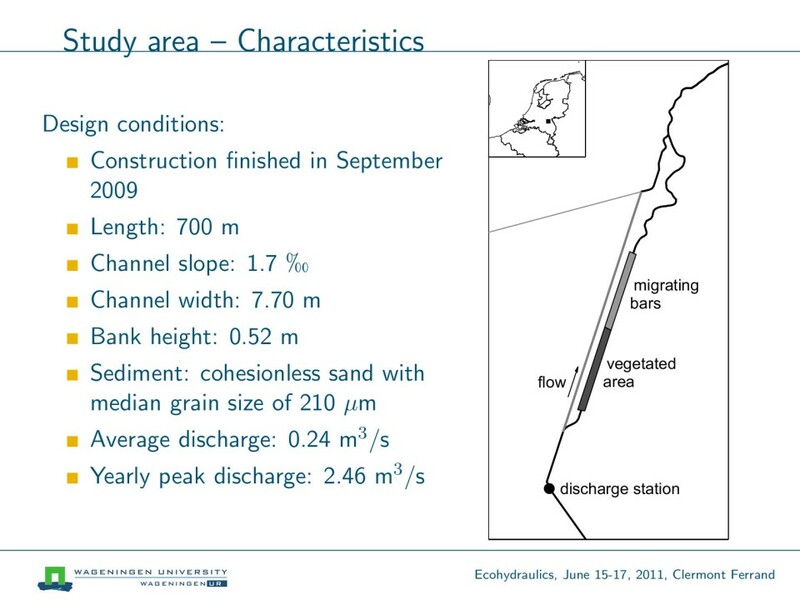 The cross-sectional channel dimensions of the stream were dramatically reduced, to guarantee a minimum flow velocity and water depth during summer discharges. 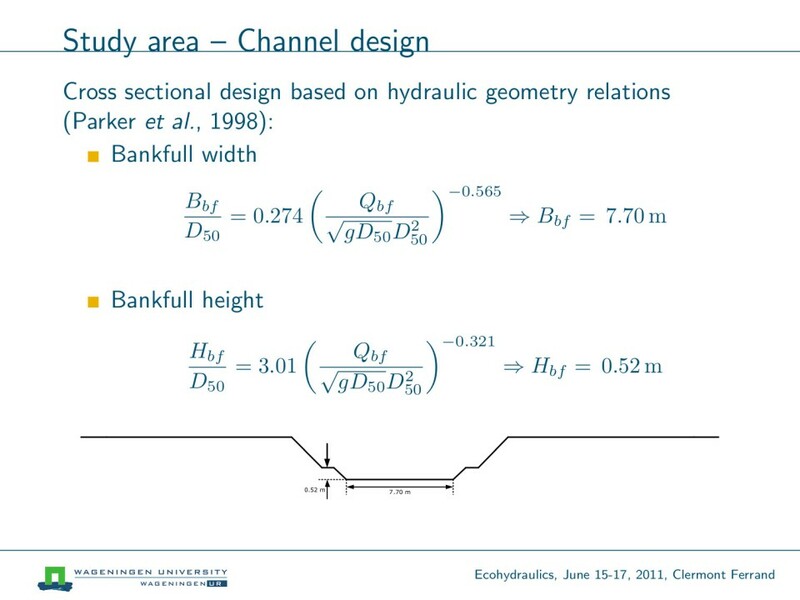 The channel width reduced from 9 to 2 m, and the depth from 1.2 to 0.4 m. The constructed stream channel is surrounded by an inundation area. The initial morphological changes show to widen especially in the channel bends. 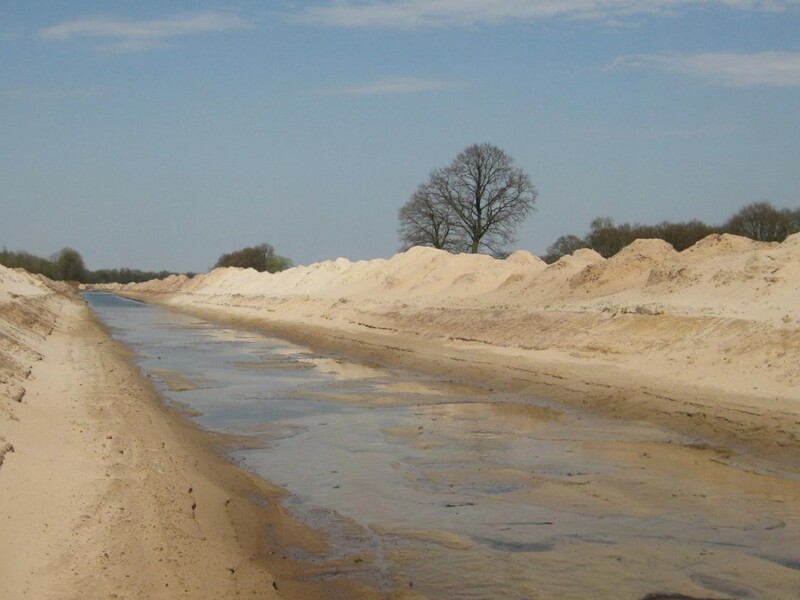 The second project under study concerns the Hooge Raam, where a new channel is constructed parallel to the previous stream. 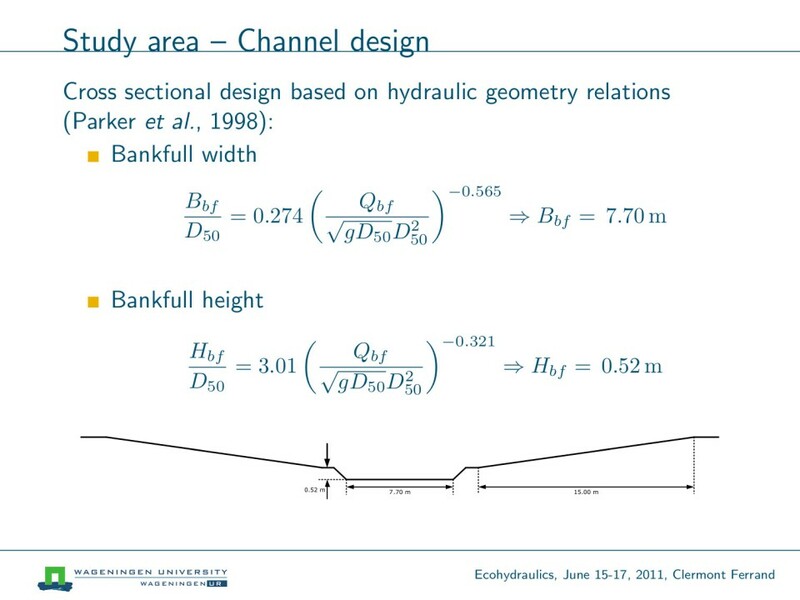 The channel was designed to investigate the autogenous formation of a meandering channel from an initially straight channel. 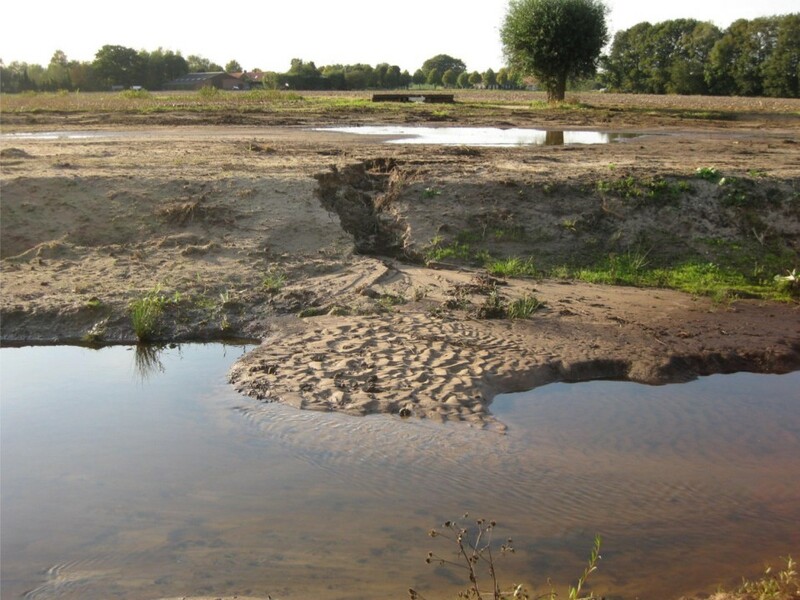 After construction of the stream, the bed morphology shows two separate responses. In the upper reach, both the banks and the stream bed become occupied by pioneer vegetation. Consequently, bars are formed from sediment retained by the vegetation. Along these bars, deep scour holes are formed. In the downstream reach, in-stream vegetation is barely present and the vegetation development is less pronounced. Upstream sediment input caused the formation of a sequence of alternating bars. This study is part of a research project called 'Valley wide stream restoration', where a large number of stream restoration projects are monitored, both on ecology and morphology. Two types of alternate bars are distinguished, i.e. 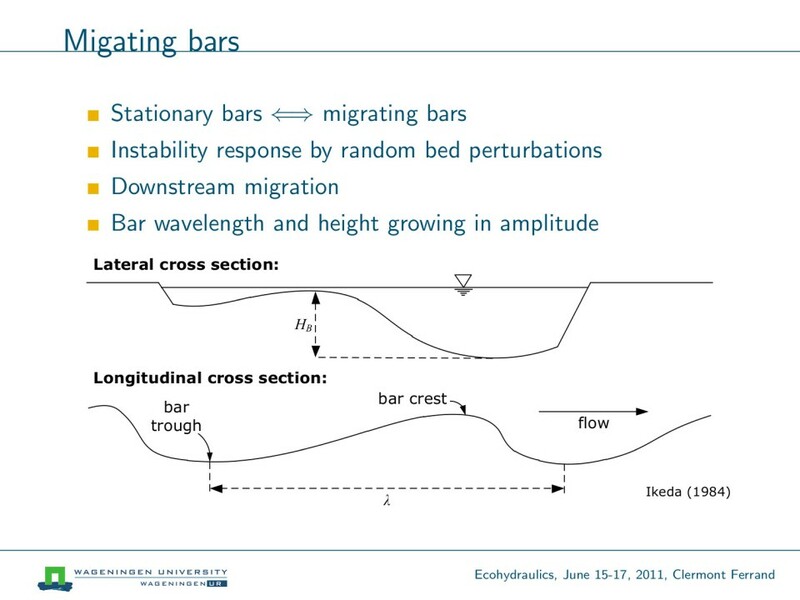 stationary bars and migrating bars. They originate from the inherent instability that causes random perturbations to grown into bars. 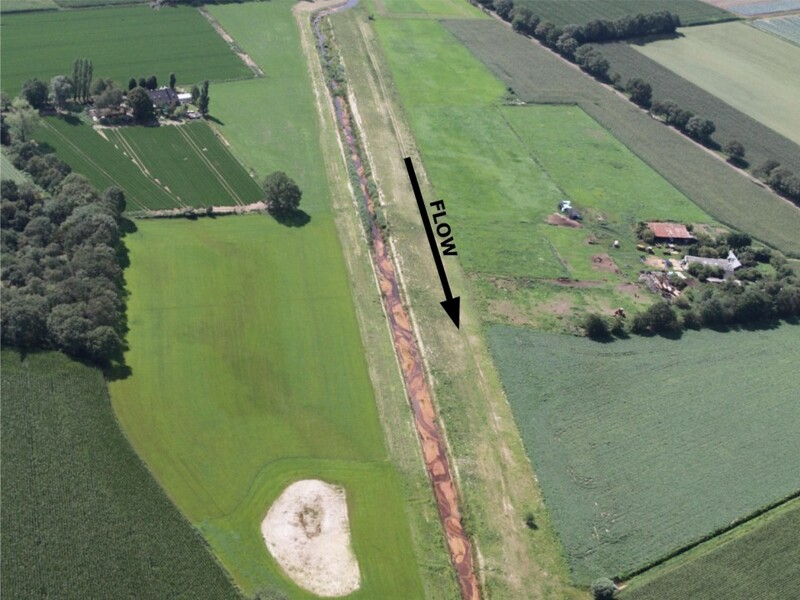 In collaboration with a Dutch water board (water authority) we performed a field experiment with the aim to investigate if it is possible to develop a meandering planform from an initial straight channel within years after construction. 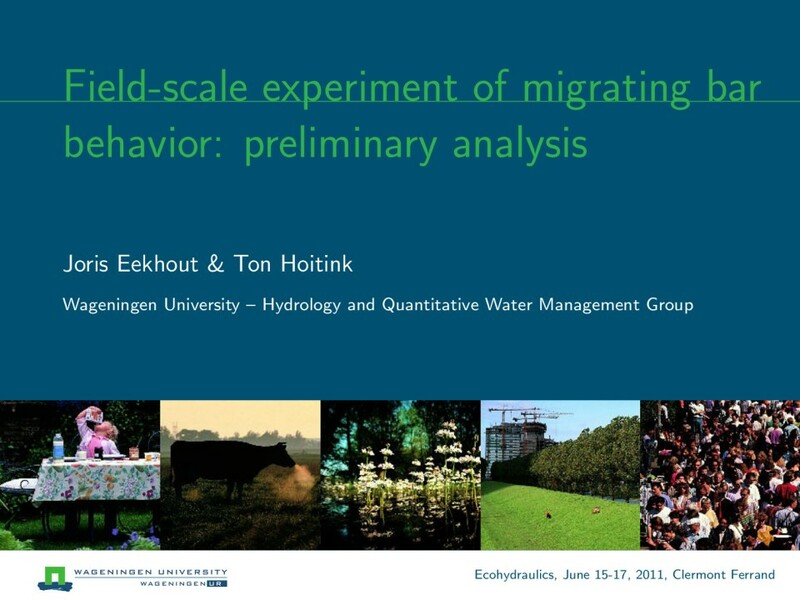 This could serve as an alternative for the current practice of re-meandering in Dutch lowland stream restoration. The cross-sectional design was based on hydraulic geometry relations, which gives the bankfull width and bankfull height. The experimental channel was constructed with a width of 7.7 meters and a depth of 52 centimeters. 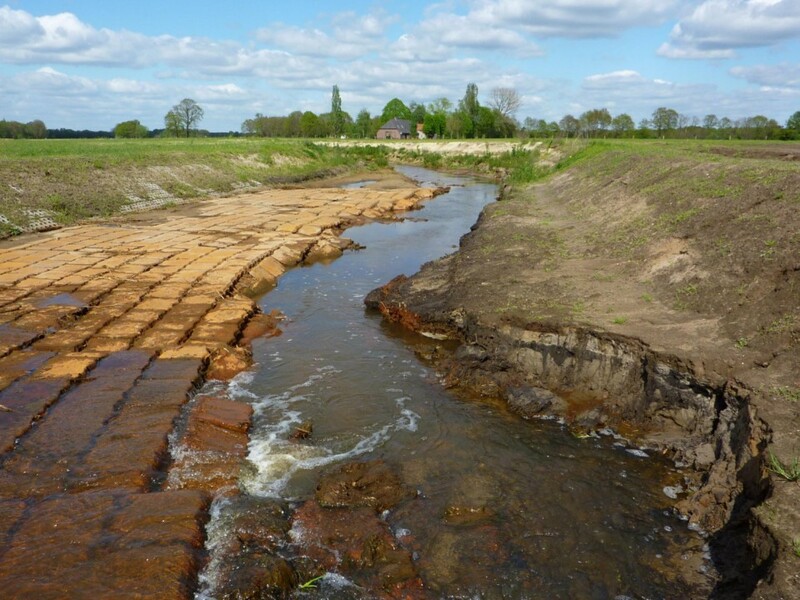 After several months, the floodplain was lowered to give more room for the channel to migrate in lateral direction. The study area is located in the eastern part of the Netherlands. The experimental channel reach had a length of 700 meters. The channel bed consisted of fine sand. This picture shows the experimental channel just after construction finished. Alternate bars formed in the downstream part of the experimental reach. In the upstream part vegetation dominated the channel soon after the experiment started. The focus of this presentation is on the downstream part. This aerial photo shows the clear distinction between the vegetated part and the downstream part where the alternate bars appeared. 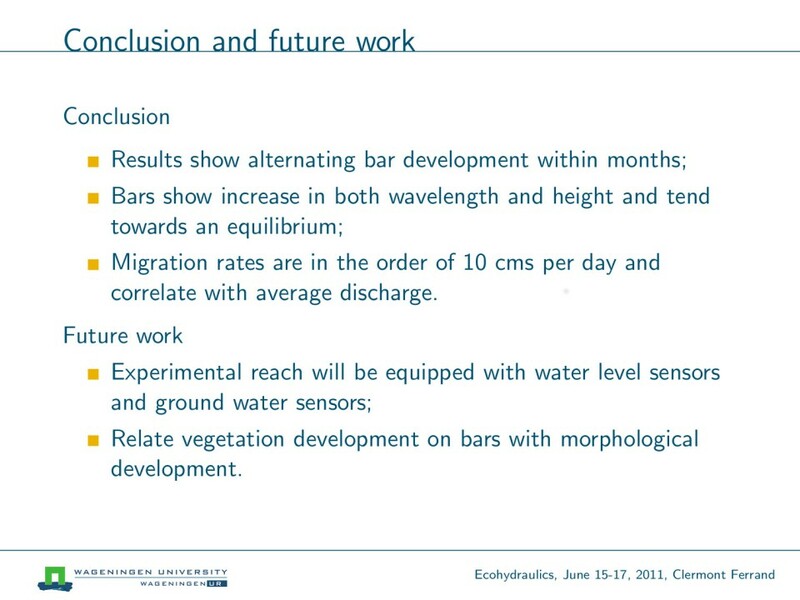 The field monitoring focussed on the morphological development of the experimental reach. Morphological data were obtained with GPS equipment and interpolated onto a grid. 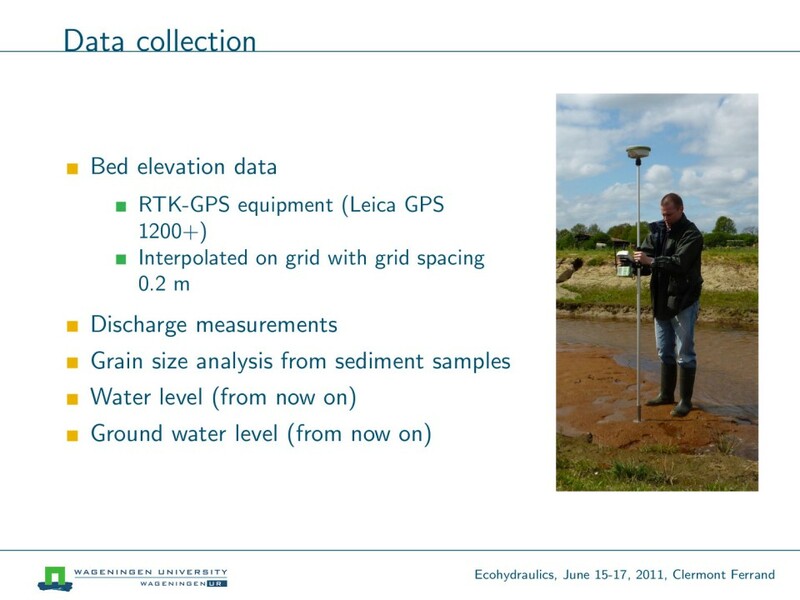 Besides, discharge and water level were measured continuously and grain size analysis was made from sediment samples. This figure shows the digital elevation model (DEM) of the first 5 morphological surveys, up to 1 and a half years after construction. 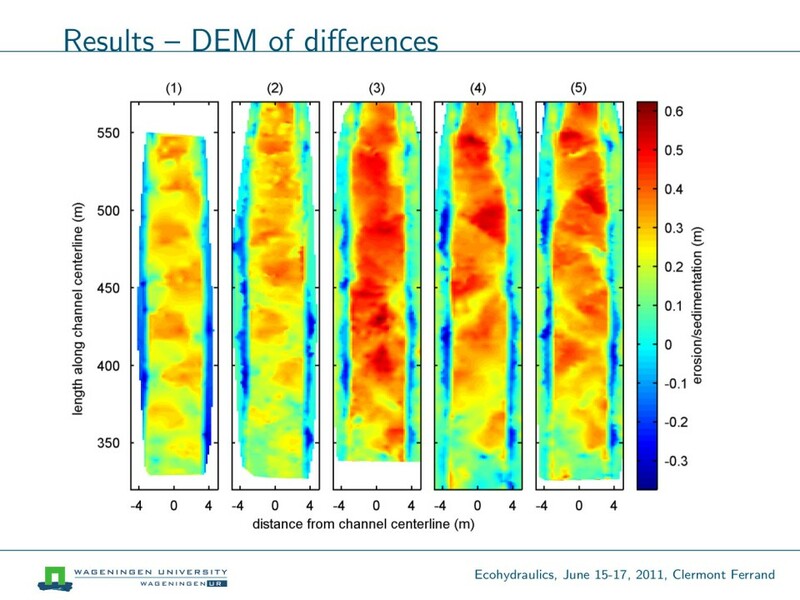 Besides alternate bars, also other morphological development was observed, such as bank erosion in the upstream part of the experimental reach. And gully erosion from the initial steep banks. Bar characteristics were obtained from the DEMs. 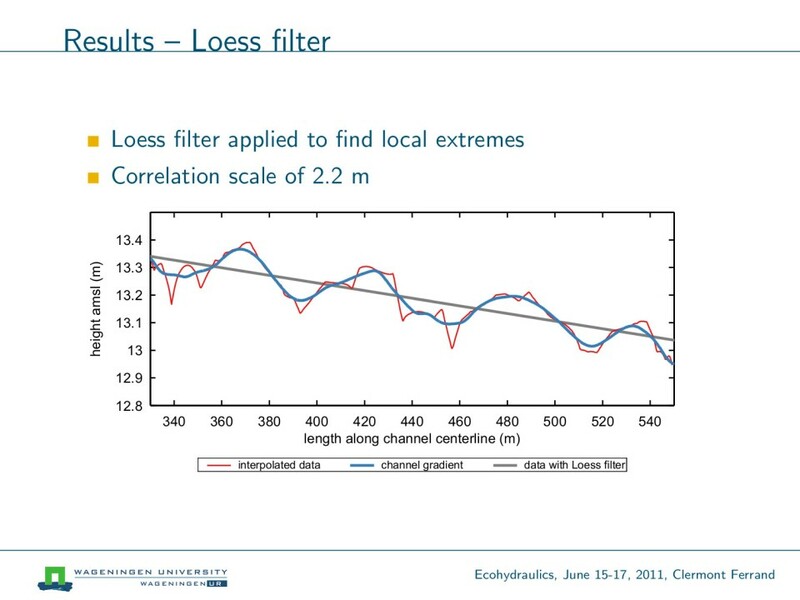 A loess filter was applied to the longitudinal bed profile to find bar wavelengths and local extremes, i.e. bar tops and bar troughs. 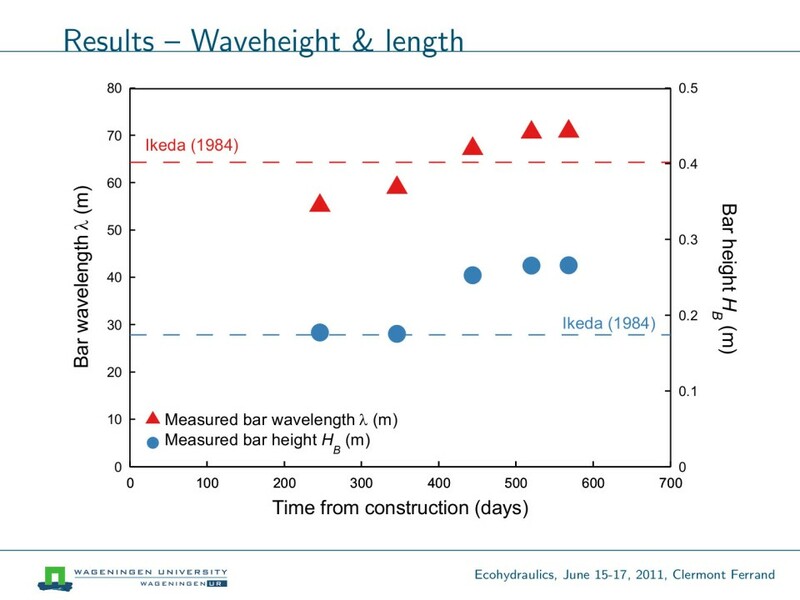 We applied linear bar theory to predict the bar wavelengths and bar heights. 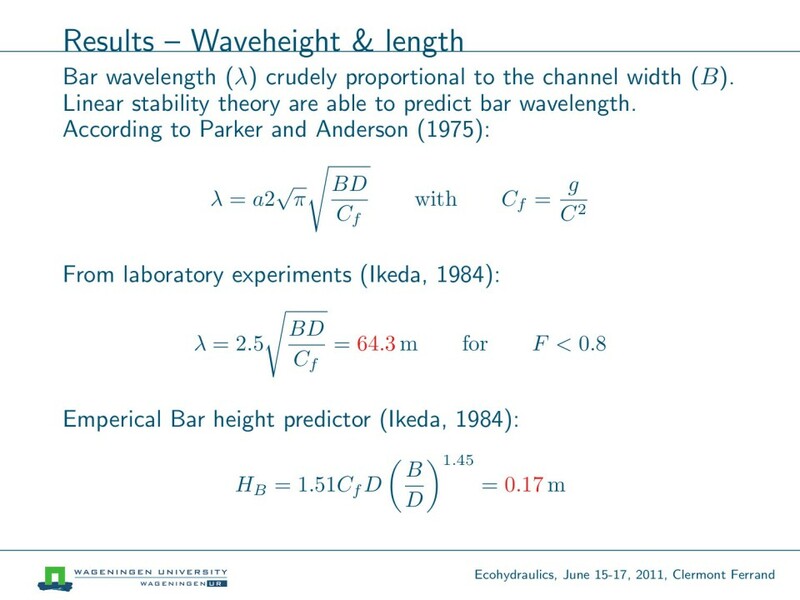 Linear bar theory predicts a bar wavelength of 64.3 m and a bar height of 0.17 m.
The observed bar wavelength and height tends towards an equilibrium. Besides, the bar wavelength and height predicted by the linear theory is close to the observations. 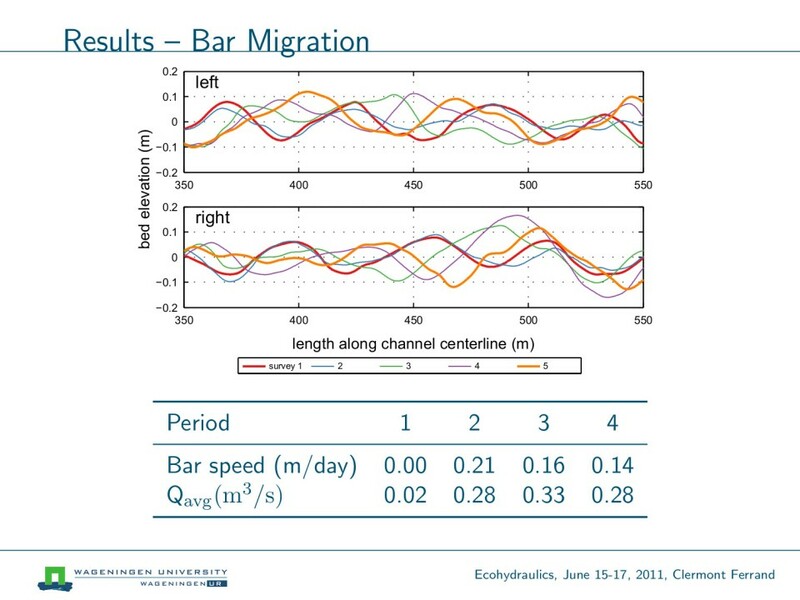 This figure shows that the bars were migrating during the study period, with bar speeds up to 0.21 m per day. 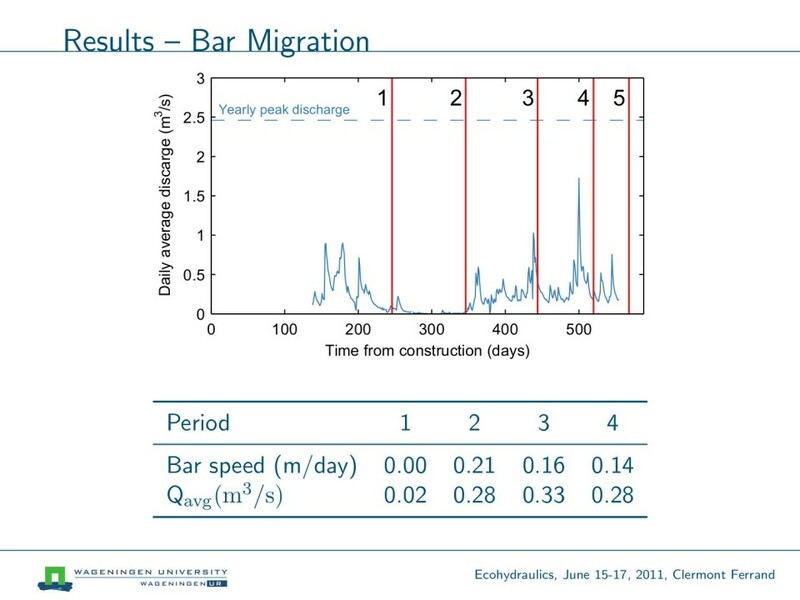 The highest bar migration rates were observed in periods with high discharge levels. 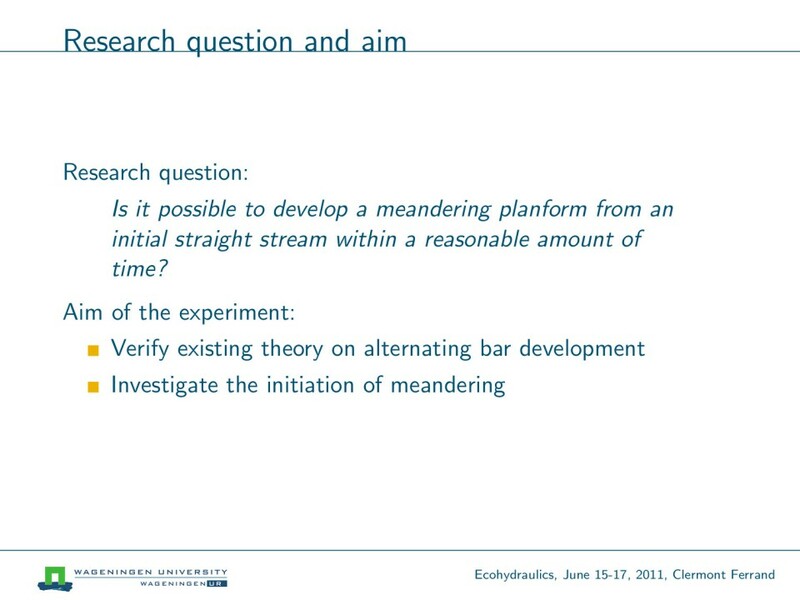 In this presentation we showed that alternate bars developed within months after the start of a field experiment. During a period of over 1 and a half years, the bars were morphologically active, with increases and decreases of bar height and bar migration.